Happy Friday Angelenos! Looking for things to do in Los Angeles? There’s so much going on this weekend that there isn’t enough weekend to fit it all in! Kick things off with a Thai-Korean street food festival, see a massive musical bash in Eagle Rock and crown your Sunday with two of the sweetest words: Mole. Festival. Tonight, celebrate two of L.A.’s staples at the Heirloom LA/Poketo Korean & Thai Street Food Festival in Glassell Park. Never since peanut butter and chocolate have two flavors intermingled so beautifully. Enjoy soju cocktails, Korean chicken wings/bulgogi/kalbi, Thai wraps/boat noodles and what’s sure to be an endless supply of Sriracha. On Saturday, THE event of the year is back on Colorado Blvd. 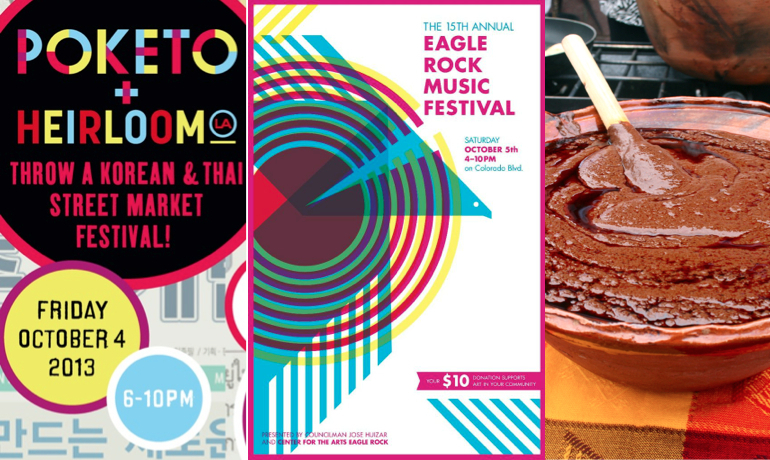 The 15th Annual Eagle Rock Music Festival will bring together thousands of your neighbors together to enjoy 40+ bands ranging from ethereal to eclectic performing on stages, churches and parking lots while noshing on the best Eagle Rock has to offer. This is the marquee, hyper local music festival where leashed doggies and baby strollers are rampant and welcomed. The minimum $10 donation will benefit the Center for the Arts Eagle Rock. So if you can swing more, please do so. All that weekend can sure make an Angeleno hungry. Fret not because the second coming of awesome will be upon you this Sunday for the 6th Annual La Feria de Los Moles, loosely translated: “The Greatest Flavors to Grace Your Taste Buds Festival.” More than a dozen homemade mole varietals will descend on Placita Olvera for one night only to duke it for the coveted crown–for FREE! Have a great weekend you lucky, lucky Angeleno!